Охотничье хозяйство в Оленинском районе Тверской области ОРОУОиР "Дубряне"
Hunting takes place in Oleninsky district of Tver region. Hunting ground OROUOiR «Dubryane» was established in 2003 and is located within the boundaries of the Oleninsky district of the Tver region,300 km. from Moscow on the highway Moscow – Riga. The area of hunting ground is 20 000 ha. On the territory there are a lot of abandoned and disappeared villages and farms where apple orchards continue to bloom and bear fruits. They used to be planted and cultivated by people that along with overgrown fields provide a rich natural food base for wild animals. A complex of biotechnical measures is carried out in the hunting ground. Annually forage fields are sown, there are feeding grounds and salt licks. The hunting ground staff have a great organizing experience in all permitted kinds of hunting in Tver region and have an individual approach to all hunting participants. We offer our guests accommodation in the authentic Russian chopped wooden house made in ancient traditions with all the necessary village conditions. In the house one can spend a great time after hunts or just walking, get warm by the real Russian stove and admire trophies obtained in our lands. If a hunter wishes to take a rest from the blessings of civilization, on the hunting ground territory there is a hunter’s house, built in Scandinavian style with o wooden roof, which can accommodate up to five people. And of course for bath lovers there is the possibility to take a steam bath in a real Russian banya, which is heated with a chimneyless stove, to plunge into the lake with spring water and enjoy aromatic tea from medicinal herbs. We welcome our guests with true Russian traditions. In the refectory warm reception, great company, sincere talk under pickles and a glass of homemade drink await you. At the disposal of hunting ground there are two UAZ: “Hunter” and “ Loaf”, two snowmobile Buran, a tractor. Our hunting ground provides all the conditions allowing hunters to enjoy not only trophies captured, but also a warm family atmosphere, which creates the feeling of being among your friends. On the highway Moscow-Riga in the direction of Riga 280 km, in the Oleninsky district turn left and drive 7 km. to settelment Mirny. 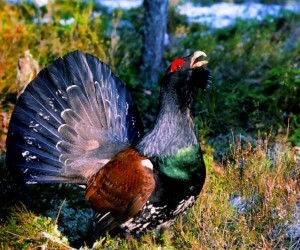 A hunt for a grouse in spring + woodcock for free. Охота на глухаря "на току"